Did you know that Vanilla comes from an orchid? The Vanilla genus has roughly 100 species, but the one most often used in the commercial production of vanilla is the Vanilla planifolia. 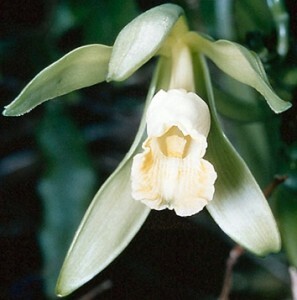 The Vanilla orchid’s blooms are large and can be white, cream, greenish-yellow, or light green in color. Some blooms even have a trumpet-shaped lip, much like a Cattleya orchid. The flowers of one Vanilla plant will bloom in succession and unfortunately have a very short lifespan. They open up in the morning and close that same day, sometimes even within just a few short hours. For this reason, pollination is done by hand by commercial growers. Because so much labor and monitoring is required by commercial growers, it is easy to see why vanilla can be very expensive. After the Vanilla orchid flower is pollinated, the orchid’s seed pod develops into what we know as a vanilla bean. Once they are harvested they are sold either as vanilla beans or used to create vanilla extract. Today, Mexico and Madagascar is where most vanilla is grown and harvested commercially. The Vanilla orchid grows like a vine and needs support such as the trunk of a tree, trellis, or a stake. The stems are long and thin and can grow quit long. Along the stem dark, thick, oblong leaves grow with aerial roots growing from each node so that the plant can adhere to its growing support. Vanilla orchids should be watered regularly. Watering frequency – as covered in this article about watering orchids – can be determined by a few different things. The whole plant shouldn’t dry out on a regular basis, however, you can let the top 2 or 3 inches of the plant dry out between waterings. On the contrary, in order to initiate flowers to bloom, you should allow the entire plant to dry out between waterings for a few weeks. As covered in this article about orchids care and light, Vanilla orchids need bright natural light in order to thrive. You’ll want to make sure that your Vanilla orchids don’t get direct sunlight because this could cause sunburn and damage the plant. When you are choosing the perfect place to grow your orchids you will need to keep this in mind. A great place to grow Vanilla orchids is in the southern end of a greenhouse because they will be able to receive indirect bright sunlight or on a shaded tree or trellis. As discussed in this orchid plant care article on temperature, Vanilla orchids thrive in a warm temperature environment with daytime temperatures between 80°F to 85°F (26.7°C to 29.4°C), and night temperatures between 65°F to 75°F (18.3°C to 23.9°C). If you live in an area that often has temperatures much cooler or warmer than these ranges, it is not recommend that you try to grow a Vanilla orchid outside. As covered in this “humidity” article on how to care for orchids, Vanilla orchids require a high humidity level of 85 percent. This can often be hard to achieve unless you are growing them in a greenhouse where you can control humidity levels. Remember, if you have high humidity levels it is equally important to maintain proper air movement to prevent orchid disease. When the Vanilla orchid is in active growth, you will want to fertilize “weekly, weakly” using a high-nitrogen solution of (30-10-10). An orchid fertilizer solution of (20-20-20) is recommended “weekly, weakly” when the orchid is not in active growth. It is important to remember to never add fertilizer to an orchid that is dry because you can cause severe damage to the roots and leaves. A potting medium mix of fir bark and peat moss will provide the Vanilla orchid with good drainage. Because Vanilla orchids grow to such great lengths you should provide the plant with stakes or other forms of support for the vines. Once your Vanilla orchid has reached a length of 20 feet, you can cut the plant (with a sterilized tool) at two to three feet intervals and repot the cuttings (bury the two bottom leaf joints) in fresh potting medium. Be sure to apply a fungicide to the cut surfaces so that your plant doesn’t get infected. You will want to be sure and keep the cuttings pretty dry for around a month or until new roots begin to develop. The Vanilla orchid produces a sap on it’s roots and stems that can be irritating to skin, so when you are potting or cutting this plant be sure to wear gloves. If the sap does get on your skin be sure to wash the area thoroughly. #1 – More Free Vanilla orchid Tips! If you’d like to learn everything you need to know about Vanilla orchid care (and caring for ALL types of orchids) we also have something called the Orchids Made Easy Green Thumb Club.